We're now in the one-week countdown for the Trilemma Adventures Compendium Kickstarter! During the campaign, I'll be running a dungeon assault scenario, where backers help direct the forces. 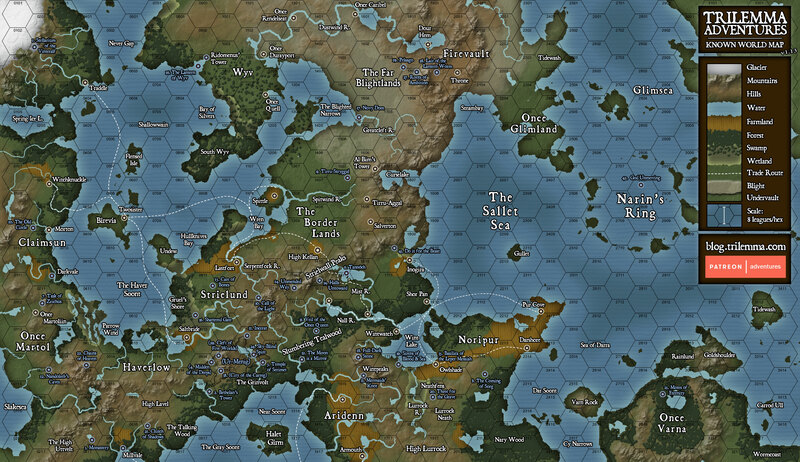 As we count down the final seven days until launch, I'll be answering questions about the scenario, and using your input to direct Grinvolt's preparations. 1. Quarter-Lord Counobel, commander of the Grinvolt garrison occupying the upper level of the Sun Temple, has sent word in three directions for reinforcements to join the attack. 2. At Eamon's suggestion, , has started spreading false rumors word in Dust Town that he intends to abandon the garrison, in the hopes of misleading Dradkin spies. 3. Over on MeWe, Thaddeus Moore directed several men-at-arms to gather great quantities of oily leaves and to make great, two-handed fans, in case a huge smoky fire was needed. 4. Gathana, flametender and the garrison's priestess of Panur has decided to spend all of her time preparing a ritual of blinding light, which the Grinvolt axewives believe hurt Dradkin eyes. Yesterday I got a question about Dradkin tactics, based on what Quarter-Lord Counobel observed during the battle. 1. The spiral stair down to the fortress is long, at least 200 steps. 3. In the chaos of victory six years ago, three axewives descended on their own; they found a cavernous gallery, spanned by some sort of bridge. Only one returned, the other two were cut down by arrows, but their small lamp wasn't bright enough to illuminate the large chamber. 4. Some axewives wanted to attack downwards, but Counobel ordered a halt. He argued that their task was to stop the raids, and the stairs were easy to defend. The Dradkin would soon be starved down in their claustrophobic mine! 6. Counobel maintains a guard post at the top. They keep a cauldron of hot oil on a bed of coals, with orders to pour it down if the Dradkin attack in force. At first the guards were in pairs, but as the Grinvolt numbers have dwindled, the duty is now a lonely one. 7. It is common for the guards to report the sounds of Dradkin far below; occasional shouts, metal-on-stone clanking. 8. The rumor among the camp followers in Dust Town is that some of the axewives have been bribed by the Dradkin for information, and may even have allowed spies. Counobel has dismissed this as unthinkable, but weird gems continue to show up in circulation. The story is always that yet another cache has been found behind the limestone wall panels. Spwack asked a great question in the comments. "Has Counobel learnt anything about dradkin tactics from the first assault? Perhaps that might influence the final push to the last fortress." 1. Dradkin don't seem to like daylight; raids on Grinvolt farms were always at night, and no scouts have been encountered in the day (though they may have been hiding). 2. The approach to the Sun Temple itself was unimpeded. The entrance faces west, and the entry chamber lights up spectacularly at sunset. Gathana believes the Dradkin both revere and fear the blinding sun and the surface world in general. 3. The upper level of the Sun Temple seems to be primarily a place of worship. Despite the raids they had launched on the surface from this complex, there were almost no warrior-caste Dradkin present at the time of the attack. 5. The first Grinvolt casualties fell in the round chamber. They were ignored in the first moments of the assault, but when they were checked later, they had no visible wounds, but their skin was crusted with salt. Common belief is they were stricken by a curse, but the warriors don't like to talk about it. 6. The area that is now a barracks was occupied by half-starved Dradkin, who put up little resistance. The area was either a prison, monastic cells for penitents, or some combination of the two. Wall engravings imply that surviving on scarce food is a moral virtue among Dradkin. 7. "Dust Town" (apparently a mine) was fully equipped with tools for digging through the loose, gravelly coprolith, but it seems to have been inactive at the time of the attack. 8. The Dradkin put up a good fight in the Night Temple, owing to the twisty entrance. The score of Dradkin there were armed only with knives and long sticks, (and no armor over their leather garments), but they used the choke point effectively, barricading it with a stone pew. After a five-minute stalemate of violent shoving and stabbing, the Dradkin allowed a small number of Grinvolt axewives to slip into the chamber, only to topple a second stone pew in front of the entrance. The exhausted axewives were killed before the rest of the attackers could dislodge the barricade. Once that happened, the Dradkin line broke and they were cut down both there, and in what are now Gathana's workrooms. 9. The most difficult fight was in the segmented hallway leading to stairs downward, against a group of eleven Dradkin, apparently heavy infantry trained in close-ranked fighting. The Dradkin infantry had what later became known as tomb shields: heavy tower shields with a low step for the user to obtain a small height advantage. The Dradkin blocked the corridor with a fan of tomb shields, trying to buy time for a small number of reinforcements to arrive from below. Grinvolt had little experience with close-ranked siege fighting, being more used to intra-clan warfare involving longboat raids: loose-formation fights and ambushes with spear, axe, and sling. They were unprepared for the wall of tomb shields, and retreated when the Dradkin second rank opened up with heavy crossbows. In an apparent tactical mistake, the Dradkin pursued, abandoning their shields. Counobel believes the Dradkin did this because they didn't realize there were so many enemies present in the complex, and thought they had routed a small group of raiders. The Dradkin infantry made it to the central chamber, but immediately found themselves flanked by axewives coming south from the Night Temple (where the fighting was now done). They made a stand there, and killed 6 axewives before they were themselves killed. 10. Dradkin infantry wear scale-like armor made from chips of bone and metal, sewn onto a three-layered leather vest. (Dradkin seem to use no woven cloth.) The armor is tied on from the back with leather ties, and several of the Dradkin' vests were not tied in their haste to ascend the long stair and retake the Sun Temple. They were armed with short, spear-like weapons, only a pace and a half long: a wide, stabbing blade affixed to long, bone handle. 11. Tomb shields are as tall as a man, but only a pace in width, and notched to interlock with other shields on either side. They are made of layers of tough fungus, matted together with pitch or resin. Axes cut into them easily, but are likely to get stuck. Gathana said that the runes on the exterior of the shields were cursed, and would entomb the souls of any who died in front of them (hence the name). She transcribed the runes, then ordered them all burned outside. As I mentioned, I'm Kickstarting a compendium of my adventures on May 1. I thought we'd have a little fun while it's running: an all-out assault on a dradkin fortress. We'll resolve it during the campaign, a crowd-sourced dungeon battle! In a Patron-only adventure, "A Clutch of Shadows," I laid out the scenario of a garrison of Grinvolt axewives and men-at-arms, occupying an underground Dradkin 'sun temple'. 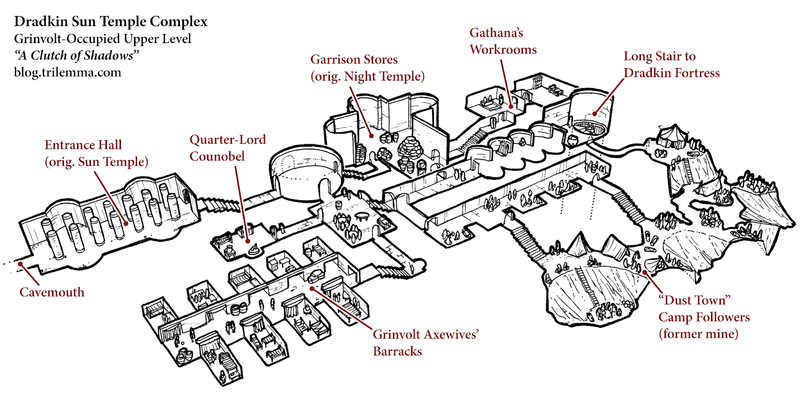 The temple is a gateway to the underworld, and has been the source of raids on Grinvolt lands for decades. In a rare display of cohesion, the Grinvolt clans came together to assault it. They surprised the Dradkin, and although they lost many brave warriors, they managed to seize the upper level of the complex. For the six years since the original attack, Quarter-Lord Counobel has kept a precarious grip on the complex. The morale of the occupiers has faded, and now with the Sun Temple's treasures carted away, so has foreign interest and the money that it brought. Grinvolt songs don't sound so cheery underground, and the echoes of glory won't bring food to the tables. Many have drifted away, returning to their fishing boats and goat pens. Unfortunately, the Dradkin threat is not gone. Leading down from the Sun Temple is a long, narrow stair, leading to a Dradkin fortress—still occupied by the Dradkin. They have spent the years preparing for a counter-attack. Dradkin spies move among the camp fires of dust town, learning the weaknesses of the occupiers. Meanwhile other, more horrible preparations are being made below. Gathana, garrison's flametender seems lost in her research into Dradkin runes and offers no counsel, but Counobel knows in his bones that the garrison's days are numbered. If it falls, all the lives that were spent securing the Sun Temple will have been for nothing, and Dradkin will once more raid the surface with impunity. He makes a fateful plan: he will spend the last of his influence on a summons, calling back every warrior willing to return to the darkness. When they have assembled, they attack the fortress below. When the Kickstarter launches on May 1, I will describe the opening moments of the attack, and reveal a new isometric map, showing the first chambers of the Dradkin fortress! Every time a campaign stretch goal milestone goal is hit, I will reveal another section of the Dradkin fortress, and describe the progress of the battle. How the Grinvolt warriors carry out their attack is up to you. During the Kickstarter campaign, I'll be running polls and taking feedback in the comments. What orders does Counobel give? Surface warriors need to use their brains to defeat prepared soldiers of the underworld on their home turf. Six years ago, Grinvolt defeated an unprepared enemy. It won't be as easy this time. Counobel's attack may succeed, but it could also fail tragically. 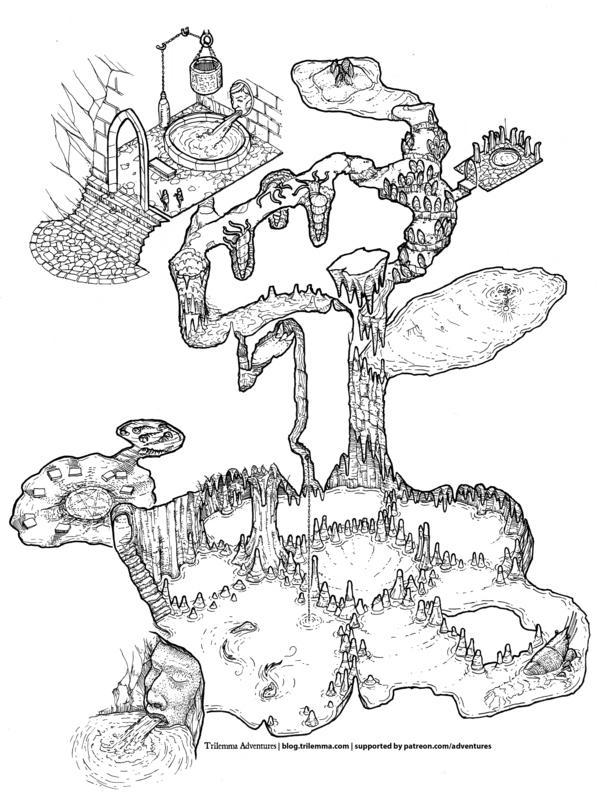 Either way, if the right stretch goal is hit, I will take the revealed map and write it up as a new adventure location to be included in the compendium. The adventure will describe the dradkin fortress in the aftermath of the attack. The battle itself will belong only to those of you involved during the Kickstarter campaign, but whatever happens will leave a legacy for others to explore in play. As well, about a hundred camp followers live within the complex (most of them in 'Dust Town'). The garrison has been faming the lands surrounding the sun temple. The soil is rocky and ill-suited to the clans' traditional crops, but another hundred non-combatants live outside in a slowly growing. His cousin sailed to Halet Girm with the last of the silver, and is returning with two longboats and 15 men-at-arms. Akum went north into Haverlow, but drank from an ill-fated pond and has lost his senses. Counobel's daughter Rolan went northeast to Grinvolt. She secured oaths from 13 axewives that they would join the attack. She then decided press further. She found none in Slumbering Tealwood, but two days ago she reached the pass at Splitpeak. As I write this, she can smell the smoke from High Kellan. With ten days left, what preparations should Counobel command? Will the axes of the Grinvolt warriors be enough, or should they concoct some other scheme for fighting in the cramped tunnels? Should he send a scout down below, or will that risk a counter-attack before he's ready? Put your thoughts in the comments!